It’s true that most people – myself included — tend to forget things over time. But something that no one ever forgets is the day they bag their very first pheasant. For me, the milestone event occurred at the tail end of the 1959 Iowa hunting season. Anticipation had been building for days. After learning that I could tag along with my Dad and cousin, Larry Luker during their Saturday afternoon bird hunt, I could think of nothing else. My excitement was more than justified. 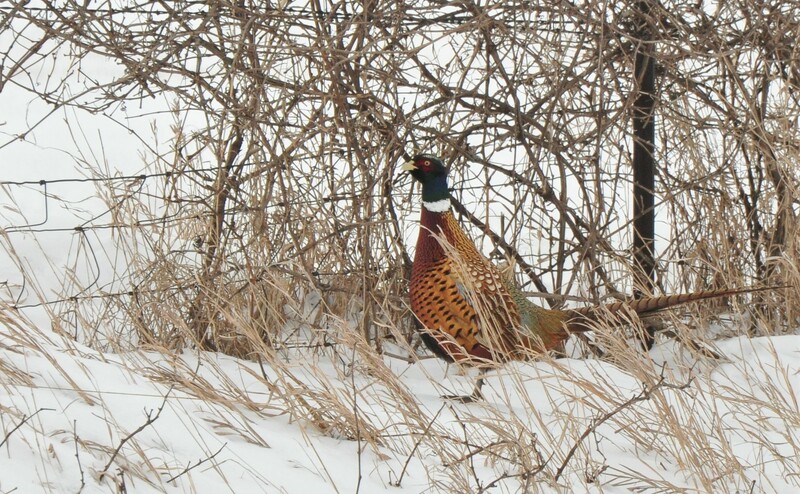 Most of today’s hunters can scarcely phantom the number of pheasants that existed in Iowa during the 1950s and ‘60s. Small, highly diversified family farms dominated the landscape. Nesting cover and winter shelter were in good supply. Virtually every farmstead supported milk cows, pastured hogs, and poultry. Soybeans were comparatively scarce. In addition to corn, most farms had significant acreage devoted to alfalfa, oats and dairy pasture. Corn fields were infested with foxtail; fall tillage was virtually unknown. As if this weren’t enough, Iowa’s pheasant friendly environment was further enhanced by more than 660,000 acres of idled grasslands established through the Conservation Reserve Program [CRP] created under the Soil Bank Act of 1956. 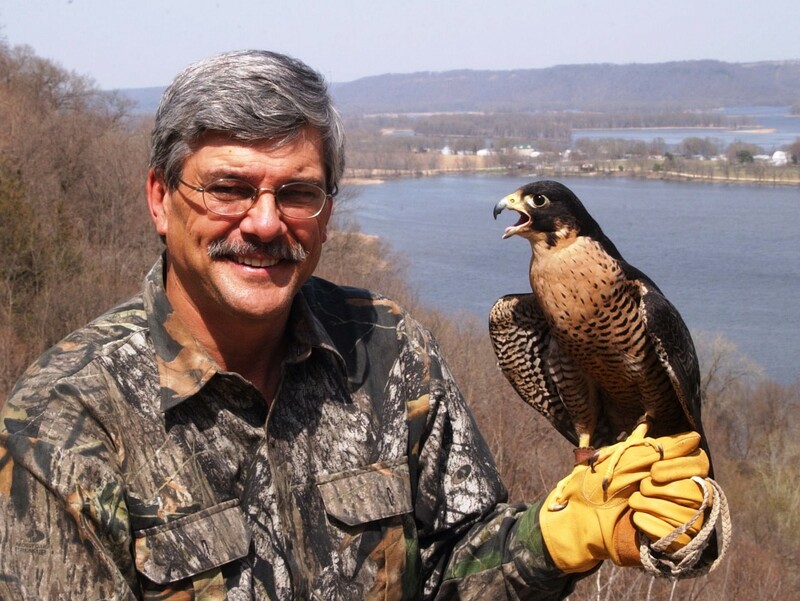 Given the above facts, it doesn’t take much imagination to understand why Iowa was a pheasant hunter’s paradise. When it came to the outdoors, pheasants ruled. 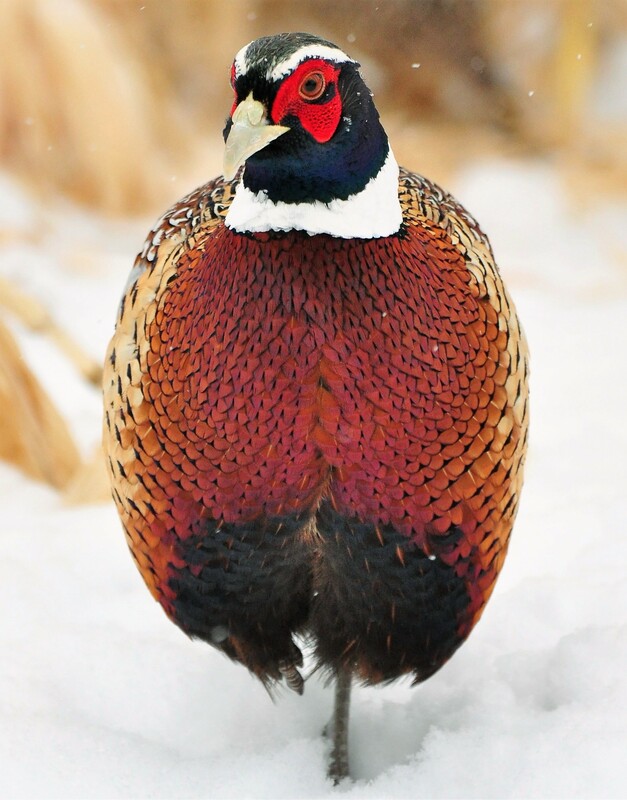 During the best years, Iowa lead the nation in pheasant harvest; topping all other states including South Dakota. Hunter numbers ran as high as 300,000. Harvests ranged from a low of 1 million to nearly 2 million roosters annually. 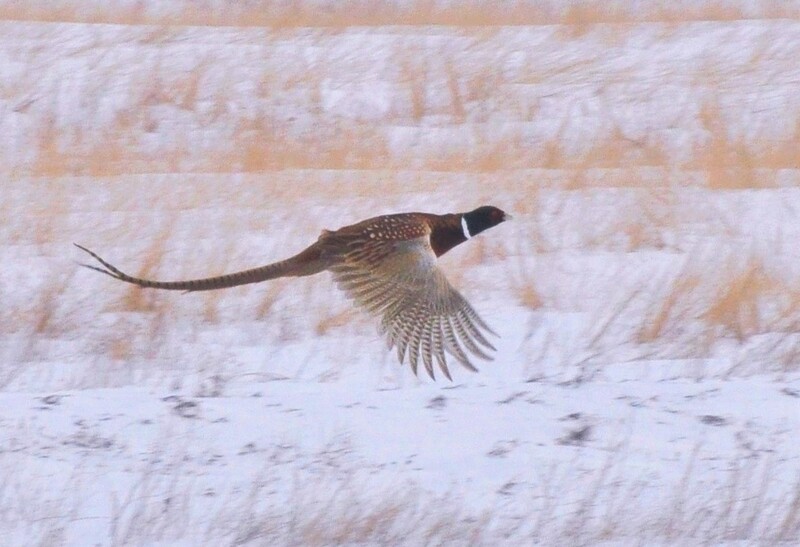 For younger hunters, pheasants represented an official rite of passage. Regardless of how many cottontails, squirrels, or ducks had already been taken; a hunter just wasn’t a hunter until that first rooster was in the bag. The long-awaited Saturday finally arrived, and our hunt began on the Harold Hoffman farm, located southwest of Fertile. The afternoon was clear and crisp; the ground covered with a blanket of snow. As previously mentioned, I was merely a third wheel, tag along. Although I had bagged a number of ducks earlier that fall, Dad thought that sitting in a blind over decoys was a much safer proposition than having a green, ten-year-old kid stumble through thick cover with a loaded shotgun. Consequently, my trusty .410 single shot would remain empty until given express permission to load. For now, at least, the shells would remain in my coat pocket while I followed, watched and learned. After failing to find birds in the corn stalks, our expedition advanced to a nearby fenceline. The line was typical for the era — a densely populated, ten-foot-wide tangle of raspberry, plum thicket, and ragweed. Judging from the bountiful supply of frozen droppings and what appeared to be about a million pheasant tracks, it didn’t take genius to determine that the old fenceline was a major ring-neck thoroughfare. The fence ran from east to west. Following a brief strategy session, Larry took the north side of the line while Dad and I remained on the south. Moving slowly forward, our hopes heightened with each new step. The action began when a single bird flushed on the opposite side of the brambles. 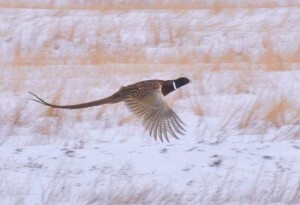 Although I never actually saw the pheasant, its panicked departure set off a chain reaction like no other. The ensuing mayhem was akin to what you’d expect after tossing a ping pong ball into a room full of set mouse traps. Chaos reigned, and the sky filled with birds as the fenceline became the center a feathered whirlwind. For some unknown reason, each and every one of those pheasants fled to the north. Cousin Larry was in tall clover while Dad and I were left high and dry. Suspecting that more birds might be lurking ahead, it was decided that Dad should join Larry on the fenceline’s north side. I would remain on the south, hoping to further deter birds from exiting in that direction. Following a few minutes of calm, our advancing party hit the second pheasant motherlode. This gathering was even bigger than the first and the sound of whirring wings and cackling roosters filled the air. As had occurred earlier, each and every bird flew to the north. Although I couldn’t see much of anything through the brushy cover, the frequent discharge of shotguns lead me to imagine that it must be raining pheasants on the other side. The hunt took a sudden turn when a few stragglers – including a couple of gaudy roosters — began breaking for the south. Reflecting the afternoon sunlight, the roosters’ iridescent plumage seemed on fire. For a young pheasant hunter wannabe, the combination of sight and sound proved too much to bear. By the time the fifth or sixth rooster had sailed past, I was reaching for my pocket. Extracting a 2 ¾-inch paper cartridge, I shoved the shell into the chamber and closed the action. As soon as the gun was closed, there was another burst of fire as more birds erupted from the opposite side of the fence. And then it happened — a closer thrashing of wings as a cackling rooster came clamoring through the thicket in my direction. 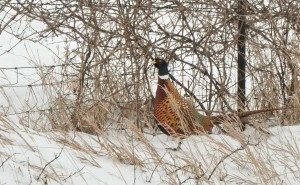 The bird’s raucous vocalizations were startling; the pheasant’s tail was a mile long. Shouldering the .410, I somehow managed to swing ahead of the bird before pulling the trigger. The shotgun barked and, to my utter astonishment, the rooster quit flying. Tumbling end over end, the bird sent up a shower of sparkling snow as it hit the ground. I did not rush to retrieve my long-awaited prize. Scarcely able to comprehend what had happened, I just stood and stared. Suddenly remembering that I wasn’t supposed to load my gun without permission, I was reluctant to answer. “I think . . . I think I did,” came my stammering reply. Knowing that this was my first pheasant, cousin Larry broke into a wide grin. By now, Dad was grinning too. “Well what do you know?” My obvious breach of loading protocol was never mentioned. I may have forgotten a lot of things over the years, but I can still recall the details of that magnificent winter’s hunt as if it occurred yesterday. No one ever forgets the day they bag their very first pheasant.